Co-Is: Ananda Pascual (CSIC/IMEDEA), Antonio Sanchez-Roman (CSIC/IMEDEA), Evan Mason (CSIC/IMEDEA), Joaquin Tintoré (SOCIB), Mélanie Juza (SOCIB), Baptiste Mourre (SOCIB). Objective: Enhance our knowledge of 2D and 3D mesoscale/submesoscale processes and their interactions at different scales combining in-situ and satellite data in synergy with numerical models. 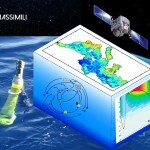 The final objective is to contribute to the improvement of CMEMS forecast modelling products. What are the physical mechanisms that govern the horizontal and vertical motion associated with meso- and submesoscale processes? 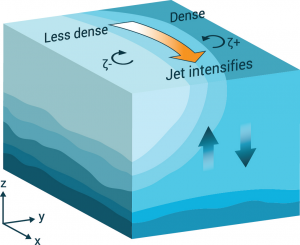 How do meso and submesoscale processes interact at oceanic fronts? 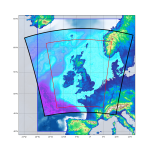 Associated with these scientific questions, MedSUB also aims to provide tools (eddy tracking and compositing codes) to bring a new way to assess the mesoscale content of the CMEMS modelling products. 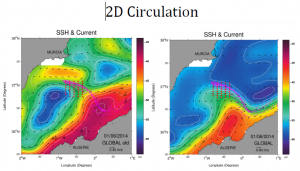 Sea Surface Height (SSH) and velocity field: (left) CMEMS global product (version until October 2016). (Right) new CMEMS global product. Magenta dots correspond to drifter’s positions from 25 May to 1 June 2014. New product forecasts significantly better the intense oceanic front due to improvements in assimilation of the mean dynamic topography. Properties derived from eddy tracker are eddy position, polarity, radius and amplitude. The ratio between amplitude and radius (eddy intensity) is a potential proxy for presence of elevated subsurface vertical motions. From left to right: Maps of western Mediterranean mean eddy intensity for altimetry, GLO, MFS, IBI on 0.5×0.5º grid for cyclones (top row) and anticyclones (bottom row). Intense mesoscale frontogenesis induce submesoscale processes (<10 km) and significant vertical motion associated with oceanic fronts. Vertical motion has been diagnosed from observations and model outputs. Figure: AlborEx experiment in the Eastern Alboran Sea (May 2014). Vertical section of salinity from high-resolution observations collected by an ocean glider. 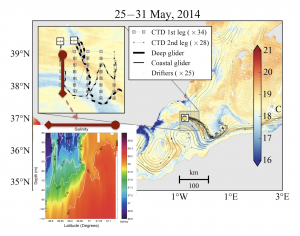 A new methodology for the evaluation and intercomparison of CMEMS oceanic forecast models using an eddy tracker and eddy composites has been developed. The methodology developed has been documented and relevant codes are being made available to the MFCs and the ocean scientific community. MedSUB has allowed us to advance our understanding of interactions between meso- and submesoscale processes at ocean fronts. Second order derived variables such as vertical velocity could be included in future updates of the CMEMS catalogue. CMEMS model products can be enriched with additional eddy properties.